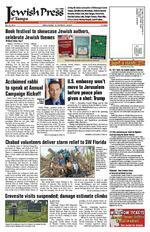 JEWISH PRESS of TAMPA PAGE 3 OCTOBER 6 19, 2017 Support Our Advertisers!They help make the Jewish Press possible. Support Our Advertisers!They help make the Jewish Press possible. [ ]Support Our Advertisers!They help make the Jewish Press possible.Support Our Advertisers!They help make the Jewish Press possible. Support Our Advertisers! They help make the Jewish Press possible. 5 time winner of The BEST OF NORTH T AMPA JohnErbs.comFREE SECOND OPINION Serving Tampa since 1971with any authorized estimate from a Do not waste your money John will match it or do better.1 mile north of Bearss Ave./Ehrlich Rd. $20 OFFfor one service in 2017 with this ad Local and one way moves. A variety of activities are planned for #GivingTuesday on Nov. 28 to support the Tampa Jewish Community Centers and Federations Annual Campaign. The theme of the day is Get Your Tzedakah On and the Jewish community join in the days festivities at the Bryan Glazer Family JCC, 522 N. Howard Ave., by donating, volunteering or simply showing up. Activities also planned in conjunction with #GivingTuesday include a chance for folks to decorate their own tzedakah box, story time for children, a stamp craft activity, a sing-a-long and acting out The Giving Tree by Shel Silverstein. Of course there will be a nosh for all to enjoy. Part of a global movement of giving back for the greater good, #GivingTuesday volunteers are needed to help make phone calls to ask for the communitys support. Volunteeers can sign up now for available shifts for the entire family at jewishtampa. com/givingtuesday. Available shifts are 9-11 a.m., 5:30 to 7:30 p.m. and 6:30 to 8:30 p.m. About #GivingTuesday Held on the Tuesday following Thanksgiving and the widely recognized shopping events Black Friday and Cyber Monday, #GivingTuesday kicks off the charitable season, when many people focus on their end-of-the-year giving. #GivingTuesday was created in 2012 by the 92nd Street Y in New York and has become a worldwide event, harnessing the power of social media to inspire and transform how people think, talk and participate in the giving season. It also brings together ganizations and businesses as well as families and individuals to encourage and amplify small acts of kindness. For more information about the #GivingTuesday event at the Glazer JCC, contact Michelle Gallagher at (813) 739-1687 or michelle.gallagher@jewishtampa.com.JCC to hold #GivingTuesday event on Nov. 28(JTA) The entire New York congressional delegation has sent a letter to Secretary of State Rex Tillerson urging him to deport a former Nazi concentration camp guard. Jakiw Palij, 92, of Queens, was a guard at the Trawniki concentration camp in Nazioccupied Poland in 1943. The 29 members of Congress representing New York, Democrats and Republicans, signed the letter calling for his deportation, the New York Daily News reported. Palij, who has lived in the United States as a war refugee since 1949, has claimed that he was forced into working as a guard and never actually killed anyone. His U.S. citizenship was revoked 13 years ago after a federal judge ruled he lied on his immigration application, but Poland, Germany and Ukraine all declined to take him. Removing Mr. Palij from American soil will send a message not only to the citizens of New York, but to the entire world, the letter said. It has taken far too long for these court orders to be carried out.Deport ex-Nazi guard, NY Congress members urge TillersonBy ANDREW TOBIN JTA news serviceTEL AVIV Israelis arent particularly amused by a recent phenomenon in their country: teenagers dressing as clowns and lurking after dark. In fact, the costumed young people have caused a nationwide panic. Since last week, dozens of the teens have been rounded up for scaring passers-by in parks and other public places at night. The incidents have happened in cities and towns sheba in the south. The phenomenon is reminiscent of the killer clown craze that swept the United States last year. In Israel, the trend has been widely attributed to the popularity of the recently released horror movie It, which is based on a Stephen King novel and features a murderous clown. In a Facebook post Tuesday, Oct. 3, many youths who had frightened civilians throughout the country. In the central Israeli city of Rishon Lezion, four 16-year-old boys were arrested Monday night, Oct. 2, for wearing clown masks to frighten visitors to a local park. The previous week, police detained an 18-year-old man in central Ramle and four children younger than 12 in the Negev town of Dimona for similar acts. While some of the detained were released after apologizing for clowning around, a number of incidents reportedly have resulted in injuries. According to a television report Oct. 3 on Israels Channel 10, two young men dressed as clowns peppersprayed a 10-year-old girl in Beersheba, while a 17-year-old male in the West Bank was lightly wounded when he fell while chasing a clown with a knife. Israelis, of course, tend to be well-armed and are generally attuned to the threat of terrorism. Mix that with a ubiquitous rumor of scary clowns and its a potentially dangerous dynamic. Case in point: A Dimona resident expressed relief to Channel 2 on Oct. 2 that he did not shoot someone dressed as a clown who startled him. As I was walking down the street on my way home in the middle of the night, someone jumped behind me with a clown costume and yelled at me luckily I didnt have a heart attack, he said. I had a pistol. Luckily I didnt shoot him by mistake. This is really not funny. are not treating the clown phenomenon as a laughing matter. In their Facebook post Oct. 3y, the Israel Police vowed that illegal clown impersonators would continue to face strict and uncompromising police enforcement.At the same time, they urged the public not to take the law into its hands and not to harm the youths, most of whom have not caused any harm to people or property. The police described the scary clowns as part of an international trend that has gathered momentum on social media. The United States over the decades has Young Israelis dressed as clowns are wreaking a bit of havoc across the country.Photo by Tolga Akmen/AFP/Getty ImagesFor Israelis, trend of scary clowns lurking after dark is no laughing matter seen various waves of hysteria over scary clowns. Last summer, hundreds of sightings were reported across the country. Many were hoaxes, but some led to arrests. In October, the White House even weighed in, with then-press secretary Josh Earnest saying, Obviously, this is a situation that law enforcement is taking quite seriously. The sightings quickly spread to countries around the world. But Israel Police spokesman Mickey Rosenfeld told JTA on Oct. 4 had come to Israel in a serious way. Weve seen a case here or there over the years, but nothing on this kind of major or national level, he said. The Israeli news website Ynet reported that teenagers were circulating a list of suggested times and places that clowns should work across the country. A video of a clown who appears to be holding a knife in Beersheba is making the rounds on Israeli social media. In response to what it said were reports by students of scary clowns lying in wait for civilians and children, the Education Ministry issued guidelines Oct. 3 for handling the threats, including advising parents to promote awareness of the issue and report any encounters to the police. For educators, the ministry advised, It is important to emphasize and take into account the age of the students. The conversations must be adapted to their developmental stage, and shouldnt frighten but rather convey soothing messages and increase their sense of security. Meanwhile, many professional clowns in Israel are worried that their image is being tarnished by the impostors. Itzik Ozeri has performed for decades as Itzik the Clown in the local media, at parties and at Schneider Childrens Medical Center in Petach Tikvah. Everybody is afraid now that our jobs will go down, he told JTA. Safety is also a concern, he added. Ozeri said he was nearly assaulted on Oct. 3 he was parked outside a gig in Beersheba when a group of teenage boys walked by and, seeing him in costume, one shouted, Its the killer clown! The boys picked up stones to attack him, Ozeri said, but were stopped by a group of peers who explained, This is Itzik the Clown. Hes a good clown. Ozeri said he understood the fear. Even his 25-year-old daughter, who grew up with a clown for a father, is afraid a clown will jump out at her on the streets at night. Still, Ozeri said he has faith that this phenomenon like so many others will pass. I believe in God, I believe everything will be OK, he said. Just like this came, it will very soon pass. JEWISH PRESS of TAMPA PAGE 7 OCTOBER 6 19, 2017 withJoy Katzen-Guthrie Humanistic Jews of Tampa Bay Tradition! Sunday, Oct. 29 at 2 p.m.Admission $10 at the door, children under 12 freepresentsUnity of Tampa 3302 W. Horatio St., Tampa, FL 33609A Concert of Yiddish Songs and Broadway and Hollywood Classics RALPH BOBOArea/Branch ManagerNMLS ID 432371 State Lic. L025098 3903 Northdale Boulevard, Tampa, FL 33624C: 813.781.1024 Ralph.bobo@caliberhomeloans.com www.RalphBobo.com journalist in the Boston area for many years before moving to Tampa and has written for numerous national publications. okur, an award-winning writer, international speaker and human rights advocate, will give a presentation at 3 p.m. about her book, Chancer: How One Good Boy Saved Another A Memoir of Family, Hope and a Service Dog. Tickets are $5. band never imagined their heartwrenching struggle after adopting two infants from Russia. Her fairy tale of becoming a mother collapses under the weight of her sons battle with fetal alcohol syndrome and its crushing effects on ate, she turns to an untested, fourpawed solution: a golden retriever service dog named Chancer.. sentation will be local families who have been helped by service dogs; and service dogs from Local author Bill Sefekar will talk at 4:30 p.m. about his book, American Dreamer: A Look Into the Life of My Father, Joe Baby. Tickets are $5. Sefekar spent years working with his father, reviewing his personal journey, writings and memorabilia before he passed away in 2014 at the age of 97. The story features love, courage, humanity and faith, all percolating from an immigrant High Noon, The Hollywood Blacklist and the Making of An American Classic, will speak at 5:30 p.m. Tickets are $20 and include a 5:30 p.m. preprogram dinner buffet and a post-pro gram showing of the High Noon. One of Hollywoods most enduring classics, High Noon and produced by two sons of Jewish immigrants and directed by a history has mostly overlooked, until now, is that it was written and Scare and the Hollywood blacklist. Jews were the main targets of the Red hunters and Jewish studio heads and community leaders faced a crisis of conscience. The including the Jewish screenwriter who faced a subpoena to testify weighed and the response of his friends, business partners and the Jewish community. Washington Post in London, South taught journalism at Stanford and the University of Texas, is a past LA Times * tions are primarily selected from the approximately 250 authors of new books represented each year by the Jewish Book Council, based in New York City. The Council annually select the top new books containing a Jewish theme or written by a Jewish author, as a means of supporting and promoting Jewish literature. will be open at the JCC on the Cohn Campus throughout the festhe store, as will $1-$5 unedited or pre-published versions of books received from the Jewish Book Council. tions with a series of book discusprograms in 2018. Conversations presenting sponsor. Other sponsorships can be obtained by contacting Michelle Gallagher at (813) 729-1687 or michelle.gallagher@jewmation about the 2017-18 Jewat (813)769-4725; brandy.gold@ jewishtampa.com. One of the most memorable moments came when a group visited a nursing home that had been without power for days and was running dangerously low on supplies. The volunteers provided them a truckload of drinks, snacks and clothes, as well as toiletries. The women began to pray in thanks for G-ds help in the form of the volunteers. One lady told a student, Youre a beautiful angel. Bill Barnett, the mayor of Naples, put it best when he addressed the group. We needed your help, and youve answered the call, and we will not forget the kindness youve shown today. Rabbi Mendy Dubrowski of Chabad Chai of South Tampa and Rabbi Pinny Backman of Chabad USF commented on how inspired they were by the devotion of so many students and young professionals to help those most in need. Â Rabbi Dubrowski, who helped or ganize the Naples trip, said that in addition to that effort, a U-Haul truck full of supplies was PAGE 16 JEWISH PRESS of TAMPA OCTOBER 6 19, 2017 RELIEFno power for several days and she had nowhere to turn. Â Immediately the team reassured her they were there to help, and would remove the tree. Using chain saws, machetes, and power saws, they removed the tree, limb by limb. You must have been sent by G-d, McWilliams said. Another team was sent to remove debris and bring supplies to a school in the Ever glades. Teachers there cried at the site of the Chabad volunteers. Â And others were sent to clean up a home belonging to Katherine Nolan, a 96-year-old World War II hero. She was one of the fewwomen serving in the military who helped liberate Nazi concentration camps. One of the volunteers whose grandparents survived those camps was awestruck by the opportunity to give back to Nolan, a woman who had given so much. CEMETERYand a no-interest loan, but more is still needed. Shortly after Irma blew through last month, Doug Negretti, chair man of the Jewish Burial Society, said damage repair estimates ranged from $50,000 to $75,000. Now, with updated repair estimates, that figure has risen to sent to Key West through Caring for the Keys, an organization started by a Chabad USF Alumnus who now is part of Chabad Young Professionals. Â Chabad Florida headquarters is continuing to send supplies and meals to the Caribbean as well, he said. Â Â While we hope and pray that there be no more natural disasters, it was heartwarming to see our community rise to the occasion, and give of their time and recourses to help out those who need them most, said Rabbi Dubrowski. The relief effort to Naples was sponsored in part by Doug and Maureen Cohn. $93,000, he said, and could climb higher once the extent of damage to the irrigation system is known. We are still holding burial ser vices. That never stopped. We have had six burials since the storm. But we rope off the rest of the cemetery when we have burials and we are not allowing people to visit the graves of loved ones because we are afraid someone could fall into a hole and get hurt, said Negretti. When a burial service is not taking place, the entrances to the cemetery are blocked. Â He noted that the Jewish portion of the cemetery was largely un scathed by the hurricane, but other sections of the cemetery were not so fortunate. Â When eight huge trees and 20 medium sized ones were blown down by Irma, the roots of the toppled trees destroyed storm sewage and irrigation lines and left gaping holes in the ground. In one case, a casket entangled in roots of a large tree was unearthed when the tree toppled. The casket has since been reburied, Negretti said, and the downed trees, save for stumps and roots, have mostly been cut and cleared from the cemetery. I have everything lined up to get repaired. We plan to replace anything broken, Negretti said. Â Half of the drainage system is knocked out and the irrigation main was destroyed, so we need to replace the main. Then we can turn the irrigation system on, zone by zone, to tell how much of it is damaged, he said. To get it all back where it was before, it will probably take six months, he said. Even if all work is not done right away, he is hoping the large tree stumps can be removed and the ground can be leveled so Â gravesite visitations can resume in about a month. Some help is on the way Â Jewish Federation Executive Di rector Emilie Socash said the board met Tuesday night, Oct. 3 and took the following action: the 2017-18 allocation of $10,000 to be paid immed iately and applied to the urgent needs. additional $10,000 in funding as an incentive match to monies raised by local synagogues. Â Burial Society up to $30,000 as quickly as it s needed, interest-free Socash said she also submitted a request for $25,000 on behalf of the Burial Society to the national emergency fund of Jewish Federations of North America. She said he hopes to know in the next couple of weeks if that will be funded. Â Negretti said the damage is not covered by insurance. Earlier this year, on April 1, anniversary of the Burial Society, formed by mem bers of St. Petersburgs Congregation Bnai Israel and Temple Beth-El, purchasing the 15-acre facility. At the time of the purchase from a national cemetery company, Burial Society members pledged to restore and upgrade the facility, which had been in decline. In the years since, a variety of improvements have been made there, including repairing the ir rigation system, refinishing the roads, upgrading signs, adding new grass, doing extensive landscaping and better grounds maintenance, installing a wash basin for hand washing as well as rock bins, creating a new pricing structure and adding other new features. Chapel Hill was started by Congregation Bnai Israel more than 45 years ago and was sold to a national cemetery company in 1998. It is a predominately Jewish cemetery although there are non-Jewish sections. About 8 of its 15 acres are cleared and the rest is undeveloped. The cemetery is located at 12905 Wild Acres Road in Largo. TAMPA JCCs & FEDERATION ANNUAL REPORT 2016-17 WWW.JEWISHTAMPA.COM WWW.JCCCOHNCAMPUS.COM WWW.BRYANGLAZERFAMILYJCC.COM Tampa JCCs & Federatione Tampa Jewish Community Centers and Federation (TJCCF) is the umbrella organization that includes the Tampa Jewish Federation, the JCC on the Cohn Campus, the Bryan Glazer Family JCC and several strategic, community-based committees. TJCCF is governed by a volunteer board of directors that oversees the operation of the entire organization in concert with the professional management staff. The organization also owns the Harry and Jeanette Weinberg Assisted Living Facility, which operates as separate Limited Liability Corporation (LLC). We are a binding force that unites Jews and non-Jews across Tampa Bay. To learn more about the Tampa JCCs and Federation visit us online at www.jewishtampa.com or contact Alissa Fischel at 813-769-4726.Tampa Jewish FederationAs the major instrument of Jewish philanthropy and engagement in the Tampa area, we are a community-driven organization committed to taking care of the needs of the Jewish people and building a vibrant Jewish future across Tampa, in Israel and around the world. rough the eorts of our Annual Campaign and the generous support of our community and community partners, the Tampa Jewish Federation is able to provide critical assistance to a signicant number of agencies that apply for funding allocations. During the 2016-17 allocations process, agencies met together to present their compelling needs and accomplishments to the allocations committee, this year chaired by Debbie Taub. Each agency presented a synopsis of their most critical need, which helped to further educate and enlighten committee members and representatives from other agencies present. 2016-17 Board of DirectorsPRESIDENTRochelle WalkVICE PRESIDENTSLynne Merriam Cindy Spahn Herb SwarzmanIMMEDIATE PAST PRESIDENTJonathan EllisTREASURERJoseph ProbascoSECRETARYJoyce Whitman TawilDIRECTORSLindsay August Adam Chernin Maureen Cohn Francine Dobkin Sharon Feen-Wallace Laureen Jae Ronald Pross Jason Rosenberg Sue Schoenbaum Melinda Sheer Steven Specter Leah WhitmillWHO WE ARE Tampa Jewish Community Centerse 2016-2017 year was very active for the JCCs, highlighted by the successful opening of the Bryan Glazer Family JCC (BGFJCC) on December 8, 2016. e Ribbon Cutting Ceremony was attended by over 400 dignitaries, donors and members of our community. We also hosted a Community Open House on January 8, 2017 that was attended by more than 1,500 people. e success of the BGFJCC can be measured by membership that reached 2036 active memberships and 4338 active members by June 30th. Part of the vision for the development of the new JCC was to reach the unaliated in the Jewishcommunity, we believe we have accomplished that because our membership mix of those previously unknown to us is approximately 60%. Our daily usage average in the tness center is just over 400 during the week and 250 on the weekends. Additionally, we have people at the J daily for swim lessons, adult & senior programs, drop in Mah Jongg, visiting FIBA, TJFS and the many events. Over 200 events and meetings were held in the BGFJCC. ey were made up of social, corporate & not-for-prot and we also provide free meeting room space for community organizations including our neighborhood associations and the Tampa Police Department. e Roberta M. Golding Visual Arts Center averages 46 class participants on a daily basis. e Cohn campus is signing up new members on a weekly basis. Enhancements to the property are evident to all, on the exterior grounds thanks to the leadership and guidance that Maureen Cohn has provided. On the interior we have improvements to the GroupEx room and the sauna. Most recently we cleared the additional acreage that we received from our new neighbors and are assessing how this additional acreage can be enhanced to further improve the property both for summer camp and throughout the year. Tennis and swim lessons were added as opportunities for our members and guests this past year. JCC on the Cohn Campus averaged 37 programs for members and guests per month.Strength in Numbers Fundraising for the 2016-17 campaign year surpassed last years numbers as a result of increased gis and designated giving. We had a terric campaign this year, lead by Lynne Merriam. In Womens Philanthropy, o ver $645,000 was raised from 576 donors, and three new Lions of Judah were welcomed. e Young Adult Division raised over $45,000 and engaged singles, couples, and families with continued high-quality programs. Total Financial Resource D evelopment for the year came in at more the $2.3 mi llion, which is a slight increase over last year! TAMPA JCCs & FEDERATION ANNUAL REPORT 2016-17 WWW.JEWISHTAMPA.COM WWW.JCCCOHNCAMPUS.COM WWW.BRYANGLAZERFAMILYJCC.COM Community Leadership Awardse Community Leadership Awards recognized and honored those who have made a signicant impact to our organization or within a local Jewish community agency. Recipients embody the principles of dedicated leadership, tikkun olam and commitment to enriching the continuity of Jewish life locally and worldwide.Campaign Kickoffe Campaign Kicko ocially begins the Annual Campaign of the Tampa Jewish Federation to raise essential funds to support an abundance of vital programs and services. is past years event was chaired by Lynne Merriam, 2017 Campaign Chair. Rabbi Joseph Telushkin, spiritual leader, scholar and acclaimed author captivated the audience with his topic, Why the Jews? The Reason for Antisemitism. Over 250 supporters attend this program.Womens Philanthropy e Lion of Judah Society honors women who contribute $5,000 or more to Federations Annual Campaign. e Lion of Judah is a symbol of a Jewish Womans strength, a symbol of her caring about the organized Jewish world and a symbol of her nancial commitment to repairing the world. is past year, een Lion of Judah members attended the International Lion of Judah Conference (ILOJC) in Washington, DC. Maureen Cohn was honored with the Kipnis-Wilson/Friedland Award at this years conference for her tremendous contribution to the Tampa community. e Bobbe Karpay (zl) Women of Distinction Program bears Bobbes name to honor and inspire women of the Tampa Jewish community to see the simple elements of the community and make life distinctively better. Each honoree exemplify Jewish values and commitment to their organizations and the Jewish community. Nearly twenty women were honored this past year from Jewish organizations throughout Hillsborough County. Guest speaker, Alina Spaulding, who immigrated to this country in 1979 with the help of many Jewish agencies funded by our Federation dollars addressed the group.Cuba MissionTwenty-two individuals participated in a Mission to Cuba and returned invigorated and amazed by the Jewish community in Cuba. ere are several dierent synagogues in Cuba that all work together to keep the approximately 1200 Jews in Cuba engaged in Jewish living. One of the most rewarding aspects was to hear just how much our Federation dollars are helping the Cuba Jewish community through the eorts of the Joint Distribution Committee. Four plus, large suitcases full of needed items were given to the Jewish communities including medicines, toiletries, clothing and childrens supplies, from the members of the mission.Professional Community Connection (PCC)Professional Community Connection is an endeavor in fostering the development of networks and relationships between Jewish professionals and businesses in the Tampa Bay area. PCC provides a platform for Jewish business people to meet each other, network and provide referrals that would lead to increased business opportunities; increases business professional involvement with the Jewish community and the Jewish Federation and raises awareness and understanding of the Tampa Jewish Federation. ree networking events were hosted this past year at a variety of locations with hundreds of FEDERATION HIGHLIGHTS Jewish Community Relationships Council (JCRC)Over the course of the 2016-17 year, under the steadfast leadership of Jonathan Ellis, the Jewish Community Relationships Council implemented new initiatives to address the concerns that aect our local community and abroad. As the public relations arm of the Tampa JCCs and Federation, our priorities include community outreach and legislative relations measures related to Israel, interfaith programming and social action. Our primary focus during the year was two-part. First, the JCRC continued to play a leadership role in supporting the Hillels of the Florida Suncoast to further implement strategies to combat the BDS movement (Boycott, Divestment and Sanctions) on the USF Campus. rough Federation allocations, the organization was better equipped to promote Israel in a positive light though speaking engagements, social media eorts and interfaith gatherings. Secondly, the JCRC established new relationships with various religious communities, including those of the Muslim faith. Given the tumultuous political climate and the rise in anti-Semitism and hate crimes worldwide, the council determined it critical to start the dialogue between other minority groups that, too, face discrimination in and out of our local community. e JCRC continues to collaborate with the Israel Action Network to oversee three task forces to address the BDS problem across Tampa Bay, including the mainline Presbyterian Task Force, the Business Task Force and the Media Task Force. Annual Presidents Dinnere Annual Presidents Dinner is the Tampa Jewish Federations premier event held to celebrate our Jewish community, its growth and successes. is event is evidence of our communitys shared commitment to tikkun olam (making the world a better place). e Annual Presidents Dinner has celebrated fourteen years of tradition bringing world leaders and national recognized speakers to address our community on the most pressing issues facing the Jewish people today. e 14th Annual Presidents Dinner was chaired by Harry Cohen and Alice Rosenthal and the evenings guest speaker was Ambassador Ron Prosor. Ambassador Prosor is considered one of Israels most distinguished diplomats, having served as the former Israeli Ambassador to the United Nations. is past year, the dinner was held at the Bryan Glazer Family JCC with a maximum capacity crowd of nearly 600 and the event raised over $250,000 towards the Federations annual campaign. TAMPA JCCs & FEDERATION ANNUAL REPORT 2016-17 WWW.JEWISHTAMPA.COM WWW.JCCCOHNCAMPUS.COM WWW.BRYANGLAZERFAMILYJCC.COM Young Adult Divisionis past year, the Young Adult Division (YAD) of the Tampa Jewish Federation, continued its popular initiatives, including: the Jewish Leadership Training Institute, an 10 course leadership development program for emerging young leaders; the annual Vodka Latke, with more than 100 singles and couples gathering on December 24th at the Museum of Fine Arts in St. Petersburg hosted by the Jewish Federation of Pinellas & Pasco Counties; monthly happy hours and activities at locations throughout Tampa; a tailgate party & Tampa Bay Buccaneers game with more than 100 people participating; and a trip to the Tampa Bay Lightning Game. YAD also facilitated a series of discussion groups in the spring with Tampa area clergy on topics such as Israel, Judaism and the workplace and social justice. YAD, a brand which has served the Tampa Jewish Federation well for many years, is becoming IMPACT. As our communitys needs have evolved, so has our need to sharpen our focus on guiding young adults along a continuum towards greater involvement and developing the future leaders of our community e Florida-Israel Business Accelerator (FIBA) project is one of the most exciting and innovative initiatives in the history of the Tampa JCCs and Federation. e project was honored this past year with a Fedovation Award by the Jewish Federations of North America for its uniqueness and creative approaches to building community. Housed within the Bryan Glazer Family JCC, FIBA seeks to engage a broad spectrum of interest and engagement from among both the Jewish and non-Jewish communities. Specically, FIBA is an innovative business development and community engagement program, which operates as a conduit for Israeli entrepreneurs to open a Tampa Bay based (US) headquarter responsible for sales, marketing, tech support, and customer service for their products and/ or innovations for the North American market. e programs mission is three-fold: First, to foster economic growth and FEDERATION HIGHLIGHTS Online Outreach & Engagement InitiativesWe continue to voice our virtual presence by engaging and reaching out to constituencies online through several outreach and engagement initiatives. We have a robust social media following through our Twitter account for Jewish Tampa (our combined Twitter for the Tampa JCCs and Federation). Our Social Media eorts collectively reach thousands of people daily. We operate several Facebook pages including Jewish Tampa, JCC on the Cohn Campus, Bryan Glazer Family JCC as well as our two preschools, promoting not only a wide variety of programs, but also services, interesting and pertinent community and international related articles, and local updates. Our popular Shalom Tampa weekly e-Newsletter also brings a rising engagement level to the community, as it reaches over 4,000 (and counting) subscribers on a weekly basis. Shalom Tampa is the pulse of the local Jewish community, presenting Jewish events and participation opportunities all across Tampa. This e-Newsletter inspires people through highlights such as the Mensch of the Week column, dedicated to honoring outstanding local individuals. stimulate innovation within the expanding business ecosystem in Tampa Bay by attracting high-growth Israeli tech ventures and facilitating their launch and expansion. e second part of the mission is to engage the entire spectrum of the Tampa Jewish community including high school and college-age students as interns and budding entrepreneurs, millennials young professionals adult professionals and serial entrepreneurs as mentors and potential investors, and seniors for mentoring, investing and other coaching services. In doing so, it is our hope that all of Tampa Bay will be exposed to one of Israels most renowned commodities disruptive and life changing technological innovations and will be better positioned to learn more about Israel and help combat the rising tide of anti-Semitism and disinformation emerging within the BDS movement, as well as the many misconceptions regarding Israel so oen put forward in the media and on college campuses. e nal part of the mission is to potentially generate revenue for the Tampa JCCs and Federation to assist the organization in achieving other goals. During the 2016-17 program/scal year FIBA operated on a $1,000,000 grant from the State of Florida and some private contributions. e project was very productive and screened approximately 150 Israeli companies. From that group, eight were selected to participate in the rst cohort. e JCCs and Federation received equity in ve of the companies and a percentage of sales in the other three. For 2017-18 the state is providing a $400,000 grant and Hillsborough County has allocated $100,000 to support FIBA. e plan is to secure enough funding from grants, sponsorships and private gis to signicantly expand the program and to also explore the possibility of creating a FIBA Venture Fund. Please visit www.ba.io for more information on this exciting project. Approximately 330 people attended Innovation Fusion, featuring keynote speaker, Mr. Je Vinik. e event was a showcase for the Israeli rms participating in FIBA and it helped to secure a multi-million dollar investment in one of the Israeli companies.Florida-Israel Business Accelerator (FIBA) National Young Leadership Summer Mission to Israel JLTI Graduate Rachel Golden participated in the 2017 National Young Leadership Summer Mission to Israel with Jewish Federations of North America. Along with 100 other young adults from across the United States and Canada who are passionate about Tikkun Olam (Repairing the World) and building Jewish community with peers, Rachel visited sites throughout Israel that have been directly impacted by the support and generosity of the Jewish Federations in North America, including the Tampa Jewish Federation. She also participated in a special leadership development track for young adults who are key volunteers in their local communities, participating in best practices roundtable discussions with other young leaders on the mission. When we asked Rachel to tell us about her trip, she stated, I am so grateful to the Tampa Jewish Federation for giving me the opportunity to go on the JFNA National Young Leadership Summer Mission to Israel. Being in Israel and visiting important places like Yad Veshem and the Kotel reminded me how now more than ever its important to have a Jewish state and a place where all Jews feel safe and welcome. is trip helped me nd the drive to be even more involved locally and I cant wait to begin working with our leaders in my community to help get other young Jews more deeply connected and involved and support the Federations mission to help people locally, in Israel and around the world. TAMPA JCCs & FEDERATION ANNUAL REPORT 2016-17 WWW.JEWISHTAMPA.COM WWW.JCCCOHNCAMPUS.COM WWW.BRYANGLAZERFAMILYJCC.COM JCC Preschoolse Tampa Jewish Community Centers and Federation Preschool provides the rst steps into Jewish learning and community-building for many young families. At both the north and south locations, the Tampa JCC Preschool had another successful year, continuing a tradition of excellence highlighted by innovative programming. Both preschool branches are recognized nationally (NAC accreditation) and locally (Quality Counts for Kids.) e JCC Preschool welcomed approximately 350 children in 2016-2017. Problem-solving and inquiry are the cornerstone of the Tampa JCC Preschool curriculum. ere is a balance between individualized attention and learning cooperatively within a community. Children explore early literacy, math, social studies, science, and ne arts in ways that are meaningful to them so that they can make connections to the world around them and form deeper understandings of concepts and relationships. Learning opportunities surround the children, from the intentional design of the classroom to the activities explored on the playground. Children learn values and character development through a Jewish lens, while embracing and welcoming the diversity of our community. Families are invited to attend our Shabbat and other holiday celebrations; this school-to-home connection is a powerful component of our preschool. is year, we opened an infant room at the JCC Preschool North Branch. We quickly lled the class and now have infants on a wait list! What makes the JCC Preschool unique? In addition to the strong academic foundation, the JCC Preschool is a warm, nurturing, supportive community. From the caring, dedicated teachers to the amazing, active parents, the JCC Preschool is a welcoming place for all families. The JCC Preschool is the place to be for a great early childhood education, Jewish learning, and long-lasting relationships!Camp JCCCamp JCC at the BGFJCC oered a multitude of specialty camps that children were able to develop a range of skills in a fun and supportive environment. Our well-trained sta constantly strived to ensure that children felt at home. e counselors participated in a thorough orientation leading up to camp and were engaged with the campers daily. Each morning started with a Hebrew word of the day and the campers worked hard to use it in a sentence throughout the day. e rst month featured Volleyball, Dance, iMovie, Art, Basketball and a Multi-Sport camp. Campers enjoyed daily swimming, specialty activities, snacks and their free time in J Lo playing games. Our goal is for every child to have a meaningful experience at Camp JCC. Campers make life-long friends, explore new adventures, and create memories they will treasure forever! In 2017, Camp JCC welcomed 291 campers and CITs over nine weeks from across Tampa for an unrivaled day camp experience. For the rst time, the camp program oered three 3-week sessions over the summer. is summer was lled with new encounters and adventures. Camp JCC constructed a 12 feet high and 150 feet long zip line complete with a rock wall and new climbing challenges. Each day campers enjoyed daily morning ag ceremonies with the Israeli and American ags, rock climbing, zip line, swimming, archery, arts & cras, as well as playing Gaga (the Israeli version of dodge ball). We have also acquired 11 acres of land which has been cleared away to provide an area for our new gaga court as well as a new amphitheater style gathering spot for the entire camp to come together next year for camp traditional activities and connection. In addition to numerous eld trips, campers in grades 3-8 participated in overnights at the JCC, while 1st and 2nd graders stayed for undernights, extending their day until 8pm. First session campers enjoyed going back to the Wild, Wild, West, dressed in Cowboy garb and participating in a good old fashion sing-a-long. Our second session extravaganza included a trip to the Hawaiian Islands and then o to Israel. Our third session campers participated in an ensemble of songs and talent created by campers and sta that was presented to family and friends. Club J Afternoon Enrichment ProgramOur 2016 -17 Club J aer school program welcomed 48 children to the JCC in grades K-5. e program sta picked up the children at eight school locations throughout Hillsborough County and transported them to the Cohn Campus for aerschool programming. eir time included homework, study time, dance, soccer, yoga, art, Legos, chess, Shabbat, holiday celebrations and much more. e program also included family participation in various events such as parent vs. children kickball games and a tness challenge. e year culminated with an awards assembly and talent show. PJ Libraryrough the generosity of our continued partnership with PNC Bank and the ongoing support from the Tampa Jewish Community Centers & Federation, the Tampa JCCs were able to participate in the nationally recognized and award winning, PJ Library & PJ Our Way programs, oered by the Harold Grinspoon Foundation, or our 7th year. e support of the Tampa Jewish Community Centers & Federation allowed a matching grant from the Grinspoon Foundation. e PJ Library & PJ Our Way programs oer a free book or CD mailed monthly to families with children ages 6 months through 11 years. Learning programs include story time with PJ books, music and activities highlighting Jewish values that include unconditional love, comfort and the expression of gratitude. Now in its 7th year of operation, the program enrolled and renewed over 320 children in 2016-17, and currently serves 658 children in the Tampa area. Tampa rolled out the newest program for 9-11 year-olds, PJ Our Way, and currently has 129 active members. PJ Our Way oers the gi of exceptional books with Jewish themes to kids ages 9-11. e children, via the PJ Our Way website, choose the books that they want for the month. e safe website allows kids to visit and choose a book from a selection of four high-quality titles that are reviewed by a panel of PJ educators, parents, and kids; they receive 12 free books per year. Due to a 52% enrollment increase, we have nearly doubled our program opportunities for the community. In addition to holding bi-monthly programs and PJ Playdates, we kicked o the year with the annual PJ Library kick-o event, themed Touch-A-Truck, in September of 2016 which hosted nearly 400 guests. Some of the most memorable events of the season were the Hanukkah Hop, Challah Twisting and PJ Library Loves Disco! We look forward to rolling out a full and elaborate calendar for the 2017-2018 year. TAMPA JCCs & FEDERATION ANNUAL REPORT 2016-17 WWW.JEWISHTAMPA.COM WWW.JCCCOHNCAMPUS.COM WWW.BRYANGLAZERFAMILYJCC.COM TeensBGFJCC is now home to the Tampa chapter of BBYO in the North Florida Region. Tampa teens have been gathering to create programs, engage in Judaic activities and socialize with other Jewish teens across the Tampa Bay Area. We look forward to the continued growth of our Tampa BBYO program. e JCC Maccabi Games will now be an integral part of our teen programming at the JCC. We have spent this past year informing the community about this great opportunity for Jewish Teens ages 13-16 to participate in an Olympic-style sporting competition held every summer with over 750 Jewish athletes from around the nation and the world. We are thrilled that we will bring 13 athletes to the Games in July 2017. Health & Wellness As part of Tampa JCC membership and its ongoing tness initiatives, the JCC continues to oer an expanded menu of tness programs. Every day there are active adults participating in the huge variety of GroupEx classes at both JCC locations. e BGFJCC oered over 70 classes per week for group exercise, as well as aquatics for all ages. e walking track and pickle ball are two oerings unique to BGFJCC that were popular every day. Adult basketball leagues began this spring and over 70 men have registered for the summer league. Over twenty ve tness classes are oered at the JCC on the Cohn campus with plans to expand that over the next year. Members enjoy the personal touch they receive through personal training sessions. Some choose to expand their wellness with massage therapy.Bryan Glazer Family JCC Event Centere rst event held at the Event Center within the Bryan Glazer Family JCC was our Ribbon Cutting Ceremony the day we opened on December 8, 2016. at was followed by over 100 non-JCC events including social occasions from wedding ceremonies and receptions to birthday parties and bnai mitzot celebrations. e center was also the most utilized venue for the spring social calendar for non-prot events. We estimate that well over $1 million was raised for a variety of non-prots in the Tampa Bay area. ese events provided great exposure to the general community to the BGFJCC as they enjoyed delicious food prepared by our Executive Chef Team and seamless events coordinated by our top notch Sales and Event Coordination team. In addition, we provided use of the meeting room spaces we have free of charge to the neighborhood civic associations that surround the BGFJCC as well as other non-prot and government agencies. As an organization we are committed to providing programs to our members and their guests, and as result we use the event center and surrounding spaces an average of ten times per week. From ladies playing Mah Jongg to Monday Movie Madness and BBYO meetings, people of all ages are at BGFJCC on a daily basis.Active AdultsOur mature adults and seniors continue to enjoy comradery and fun through a rich assortment of activities and events. is past year we introduced several new programs at both JCC campuses. ese included an excursion series called Arts About Town (with trips to the Straz Center and the Henry B. Plant Museum); Game Show ursdays; the News Schmooze discussion group; Ballroom Dancing; Medicare Q&A Seminars; and Dominoes. Other oerings that the community continues to enjoy include Bridge, Mah Jongg (both lessons and open play), Crochet, Biblical Literature, and the Book Club. We have also continued our strong partnership with the USF Osher Lifelong Learning Institute (OLLI) Continuing Education.MembershipMembership is the heart of what drives daily activity at our two JCC locations. We have an excellent sales team that works tirelessly to grow our membership every month. Fortunately, their eorts have generated great results. e BGFJCC has over 2100 Active Memberships and over 4400 Active Members. e Cohn campus continues to see a gain of approximately 10 memberships per week, with the majority of those members as part of the popular Silver Sneakers. Tampa JCC Golf Tournament e Tampa JCCs held its 6th annual golf tournament presented by United Janitorial Services at the West Chase Golf Club. A shot gun start led 52 golfers o to a wonderful day on the greens. A Bloody Mary continental breakfast and buet dinner was provided by Weinberg Village Assisted Living Catering. Our rst place tournament winners were Parker Gold, Tyrette Tebbi and Paul Edelstein with an incredible score of 55. Everyone had a wonderful JCC golf experience!11th Annual Softball Tournament More than 200 people from across T ampa Bay formed eight community soball teams to compete at our 11th annual JCCs soball tournament. With teams ranging from the Hebrew Hammers to the Beth Am Swinging Stars of David, all enjoyed a good-spirited day of play at the Ed Radice Complex. Aer a very exciting playo game, the Edwin Taylor Corporation team took home the rst-prize trophy and the JCC Team (Cohn Campus Crushers) came in second place. e Phyllis Borell Jetsetters program remains a popular monthly social event at the JCC on the Cohn Campus, and this year we added it to the Bryan Glazer Family JCC calendar as well. is year the program included a variety of musical and cultural entertainment such as the Dixie Cats New Orleans Band, Zazus Review, and Klezmer Shpiel. Several active members at the Cohn Campus have taken the initiative to organize a Program Planning Group. ey met weekly to discuss possible program ideas, and have already created a popular new program called Game Show ursdays. e group organizes and runs the activity themselves. We successfully launched the Edmond J. Safra National Parkinsons Wellness Initiative 54 people registered for tness classes and 21 for the caregiver support group. Adults and seniors in our community are active and thriving. We are thrilled to be a cornerstone for the mature adult population in the Greater Tampa area and plan to grow our programming with each coming year. TAMPA JCCs & FEDERATION ANNUAL REPORT 2016-17 WWW.JEWISHTAMPA.COM WWW.JCCCOHNCAMPUS.COM WWW.BRYANGLAZERFAMILYJCC.COM The 21th Annual Tampa Bay Jewish Film FestivalTampa Jewish Community Centers & Federation along with Jewish Federation of Pinellas & Pasco Counties presented this years 21st annual Tampa Bay Jewish Film Festival, which opened on Wednesday, April 19, 2017 and ran through the following week. e committee led by Stewart Donnell, Sara Scher and Loni Shelef was proud to announce that the festival was nally legal and the committee set out to accordingly toasting its 21 Years! e weeklong festival was packed with lms that truly merit celebration. is years powerhouse line-up delighted nearly 1500 moviegoers over the week with 325 VIP guests at the opening lm. e lm festival opened with the winner of the Van Leer Award for Best cinematography and best Actor in the Jerusalem Film Festival; Harmonia which was accompanied by the awardwinning short lm, Mr. Bernstein in which a daughter meets the famous music director who lied her fathers spirits in a post-war refugee camp. Opening night included a lavish hors doeuvres and cocktail reception and proceeded into the main theatre for the opening night ceremonies which included the STARR Award presentation to this years recipients, Mr. Edward Rudd and Dr. Stuart Novick. e graduating JLTI class of 2017 was also presented and honored. e venues this year covered all areas of the Tampa, Pasco and Pinellas communities. e most anticipated venue included the Bryan Glazer Family JCC which was turned into a magnicent cultural arts experience with top notch audio visual equipment and state of the art theater seating. Other venues included; Muvico Palm Harbor; Muvico Sundial 19, St. Petersburg; e Museum of Fine Arts; Largo Cultural Center and e Hillel House USF Campus.Cultural Arts Programse opening of the Bryan Glazer Family JCC provided the opportunity for enhanced cultural arts programs. In January 2017 programs including Culinary Experience, Rhythmic Drum Magic classes, Monday Movie Madness and Readers eater were developed. Each oering had a small fee and was open to the community and to members of the JCC at a discounted rate. e classes ranged in the number of participants from 10-20 guests on average with Monday Night Movie Madness hosting as many as 60 guests. In addition to the ongoing Cultural Arts classes, the Tampa JCCs and Federation also participated in partnerships producing two very well received signature events in 2016-2017. e rst event of the annual year was a collaboration between the Tampa Bay Jewish Film Festival and the Holocaust Museum for an event called, Aermath. Guest speaker Jan Gross addressed the audience of 150 before the award winning 2014 lm, Aermath was shown. Q & A session followed the lm and all enjoyed a lavish dessert reception. In March, the Tampa Jewish Book Festival collaborated with the Hadassah Tampa Ameet Chapter in presenting an intriguing program with Author and guest speaker, Morris Wol. e program was focused on the book and investigation regarding riotous Christian Raoul Wallenberg. e interfaith program hosted over 200 guests and was widely well received by the community.Israel Independence Day Community FestivalApproximately 600 people attended this years annual Tampa JCCs Israel Independence Day celebration at the Bryan Glazer Family JCC. Tampas celebration theme, Experiencing Israel, showcased a multitude of experiences that included; Israeli food, a Skype session with award winning Israeli Author Gavriel Savit, and Israeli music was heard all aernoon by DJ John Wendleke. Attendees also had the opportunity to watch the Film Festival movie, On the Map, create Israeli cras, Lego Building, visit the Wailing Wall, enjoy Israeli beer and wine tasting, watch cooking demonstrations, participate in drum circles and visit the photo booth, which featured photo opportunities with the land of Israel. e community was also invited to register for a mini Triathlon A Race through Israel! Utilizing the amazing facilities oered by the BGFJCC, racers experienced Israel by running (the track) through Israels cities, enjoying Israels scenic routes while spinning and swimming the Dead Sea in the Mezrah Family Aquatic Center. Jewish Festival of Books and Conversationse Tampa Jewish Community Centers & Federation, in partnership with e David Gemunder Family Foundation, celebrated its annual Jewish Book Festival in November of 2016 with a series of community events designed to inspire and intrigue. Over 500 guests enjoyed the festival, which ran for one week. e Tampa JCCs and Federation is a member of the National Jewish Book Council, connecting our community with hundreds of Jewish authors who write on topics ranging from parenting to politics. On opening night, 100 guests enjoyed the comic relief of featured Author Kate Siegel, who wrote Mother, Can You Not? along with her mother, a popular producer of primetime TV, Kim Friedman. Other highlights from the 11th annual festival included sharing secrets and stories around the game table with Author Betsy Lerner, e Bridge Ladies. A foodie/date night featuring Ina Yalof; Food and the City Sunday brunch local author panel included Iris Pastor as the moderator, Richard Cohen; 20@60A Baby Boomers Run Across the U.S., Alyce Gross; Widow-Wise and Golda Brunhild; e Cantor Sang O-Key. e festival wrapped up with 75 guests intrigued by Author Jason Gewirtz; Israels Edgee Story of the IDFs Most Elite Unit the Talpiot followed by the well-known heart wrenching story by local celebrity writer David Kushner whos newest book, Alligator Candy, hit the best seller lists in 2016. e Jewish Book Festival also hosted a series of the popular bookdiscussion/wine-tasting Sip & Skype programs, which ran January through May 2017. is years featured authors included Martha Hall Kelly, Lilac Girls Sarit Yshai-Levi, Beauty Queen of Jerusalem, Maggie Anton, Fiy Shades of Talmud: What the First Rabbis Had to Say About You-Know-What, Susan Silverman, Casting Lots and Gavriel Savit, Anna and the Swallow Man. e 2017-2018 committee began meeting this past June to start the planning for the 2017-2018 festival, which will open on October 26, 2017.Holocaust Education SeriesIn early October, the HES program took the educational series out into the community schools. Students embarked on a most memorable in-school eld trip to learn about the Holocaust, and hear a personal Holocaust survival story from guest speaker and educator, Etta Donnell. Aer the lecture, students had an opportunity to ask questions directed to the guest speaker and were able to write notes on postcards that will be used in future programs. 485 students had the opportunity to engage in this program over the 2016-2017 school year.